Vladimir Lenin, King Tut and the McDonald's Happy Meal: What do they all have in common? A shocking resistance to Mother Nature's cycle of decomposition and biodegradability, apparently. That's the disturbing point brought home by the latest project of New York City-based artist and photographer Sally Davies, who bought a McDonald's Happy Meal back in April and left it out in her kitchen to see how well it would hold up over time. The results? "The only change that I can see is that it has become hard as a rock," Davies told the U.K. Daily Mail. She proceeded to photograph the Happy Meal each week and posted the pictures to Flickr to record the results of her experiment. Now, just over six months later, the Happy Meal has yet to even grow mold. She told the Daily Mail that "the food is plastic to the touch and has an acrylic sheen to it." Davies -- whose art has been featured in numerous films and television shows and is collected by several celebrities -- told The Upshot that she initiated the project to prove a friend wrong. He believed that any burger would mold or rot within two or three days of being left on a counter. Thus began what's become known as "The Happy Meal Art Project." "I told my friend about a schoolteacher who's kept a McDonald's burger for 12 years that hasn't changed at all, and he didn't believe me when I told him about it," Davies told us. "He thought I was crazy and said I shouldn't believe everything that I read, so I decided to try it myself." Some observers of the photo series have noted that the burger's bun appears at different angles, and therefore aired suspicions that the Happy Meal may not in fact be as "untouched" as the project's groundrules stipulate. Davies says there's a simple explanation for the mobile-bun effect. "The meal is on a plate in my apartment on a shelf," she says, "and when I take it down to shoot it, the food slides around. It's hard as rock on a glass plate, so sure, the food is moving." Davies' friend was the person who should have done the additional research. Wellness and nutrition educator Karen Hanrahan has indeed kept a McDonald's hamburger since 1996 to show clients and students how resistant fast food can be to decomposition. 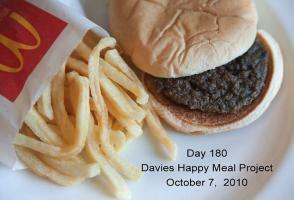 As for Davies, she said that she might just keep her burger and fries hanging around for a while as well. "It's sitting on a bookshelf right now, so it's not really taking up any space, so why not?" she said. It ceased giving off any sort of odor after 24 hours, she said, adding: "You have to see this thing." In response to Davies' project, McDonald's spokeswoman Theresa Riley emailed The Upshot a statement defending the quality of the chain's food. Riley's email also blasted Davies' "completely unsubstantiated" work as something out of "the realm of urban legends." "McDonald's hamburger patties in the United States are made with 100% USDA-inspected ground beef," Riley wrote. "Our hamburgers are cooked and prepared with salt, pepper and nothing else -- no preservatives, no fillers. Our hamburger buns are baked locally, are made from North American-grown wheat flour and include common government-approved ingredients designed to assure food quality and safety. ... According to Dr. Michael Doyle, Director, Center for Food Safety at the University of Georgia, 'From a scientific perspective, I can safely say that the way McDonald's hamburgers are freshly processed, no hamburger would look like this after one year unless it was tampered with or held frozen.'"